Two little porcelain figurines that SURVIVED WW2 - PMR Thuringia with Star Mark:- My family has had these pair of Dresden Lace figurines for years: Thety are two little figurines in costume, no more than 7cm. high, exquisitely detailed and in perfect shape, with a Jewish Star (Mogen David) on the bottom. 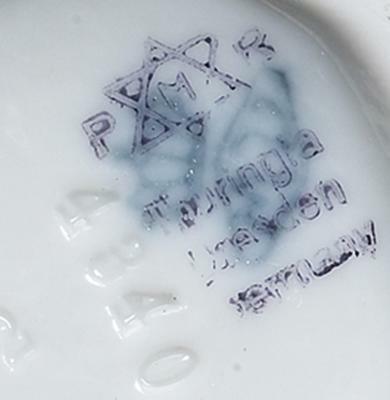 "Thuringia Dresden Germany" and over this writing is a Star of David and the letters PMR. I have heard about the collections that the Nazis had their eyes on, such as the very valuable Meissen collection that was hidden by the von Klemperer family outside of Dresden. Many thanks for submitting such interesting items. The first thing I notice about this mark is there is what appears to be an overstamp of the decorators mark over the original makers mark. The original mark underneath is a crown with some letter I can't see properly. It may be possible to identify this mark, but it would greatly help if we could read the words underneath. The better known factories tend to have instantly recognisable and distinctive marks. Crown marks are the most difficult to pin down because of their commonness. Getting back to the over-stamped decorators mark. If the mark had said PMR Bavaria, it would have been easy to relate the mark to that of Jaeger & Co (or Jäger) J&C PMR (Porzellanfabrik Marktredwitz) Bavaria. Nowadays they are known as Jaeger, Thomas & Co of Marktredwitz and their marks are JC & JTC or in crossed flowers, peacock and PMR Bavaria. However, due the geographical anomaly and the fact the mark is an over-stamp containing a star (not a registered mark of PMR Bavaria), I don't think your PMR Thuringia has anything to do with PMR Bavaria. Thuringia borders on Bavaria to the South, and Saxony (Dresden) to the East. The three states are many hundreds of kilometres apart and there is no real geographical connection. 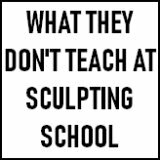 Why would an established and accomplished Bavarian porcelain maker have a lace figurine decorating workshop miles away in a different state? located in the Town of Meissen some 15km away from Dresden itself. My guess is the initials PMR being on both backatamps is purely coincidental. If anyone knows different, please post. The assured and high quality of the modelling on your two figurines is obvious and very exciting to see. If they are contemporary with the costumes, they are early period pieces. 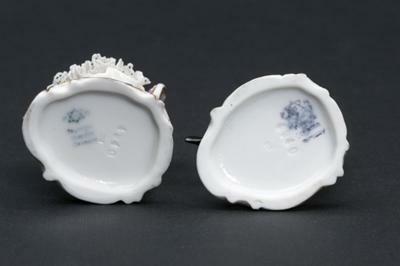 However, the style of stamping and cleanness of the bases suggests pre-war reproductions. Generally the older the model the better the modeling. These are really very good, and so could be consistent with older moulds. Modeling standards generally began to decline after the 1930's with only a few notable exceptions. 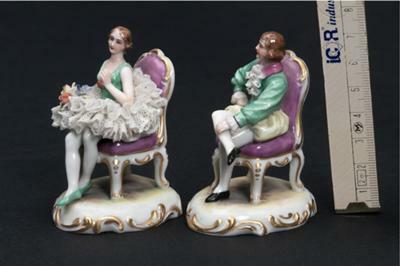 Some of the Dresden style figurines made by post war studios are simply appalling and make me blink with horror. What were they thinking? You are correct in saying many German porcelain factories were obliterated in the Allied bombing - and not just in the city of Dresden itself. This small decorating workshop may have been one of them. I have seen one or two examples of this mark elsewhere online - but not many. All have been lace figurines. I am guessing this workshop was one of those around the area of Volkstedt which began to make lace figures after the Royal licence was withdrawn from the original Volkstedt factory (Macheleid/Karl Ens/Triebner, Ens & Co.) in the 1760's. The best catalogued of these factories were Richard Eckert & Co, Beyer & Bode, Schäfer & Vater, Müller & Co (Irish Dresden) and Ackermann & Fritze. Some other factories making lace figurines in the Dresden style were Martha Budich (of Dresden), Alka-Kunst, Alboth & Kaiser, Ernst Bohne & Sons, Sitzendorf, Karl-Heinz Klette, Franz Sieber and Gisela Keilhauer. 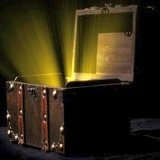 Use my search boxes to find more information within this site on these companies. I don't think your figurines, althoough quite rare and very nice and worth a bit were the 'lost reassure of the Nazi's'. 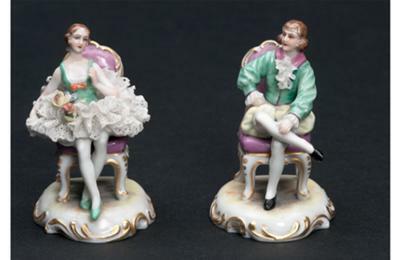 Had they had a connection to Meissen, maybe, but remember, these type of figures are terribly out of fashion in our modern world of minimalism and anti-baroque sentiment - so values are generally at their lowest possible ebb. Maybe a good time to buy, but a bad time to sell. The PMR overstamp is possibly the retailer. I have two figurines also, that are women in lacy dresses, but they are porcelain lamps. they have the P then a star of David with an M in it then R, then it says Thuringia, Dresden, Germany, they are numbered # 3957 and 3958. 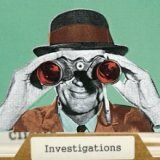 Do you have any ideas on age or worth or who might enjoy them? I have a ballerina figurine marked with a Jewish star PM and Thuringia, Dresden, Germany. What is the value in perfect condition.